Surrey County Council is facing a difficult financial position. The overall budget for Cultural Services which includes Libraries, Heritage and Surrey Arts is set to reduce from the current £8.7m per annum to £4m over the next two financial years. 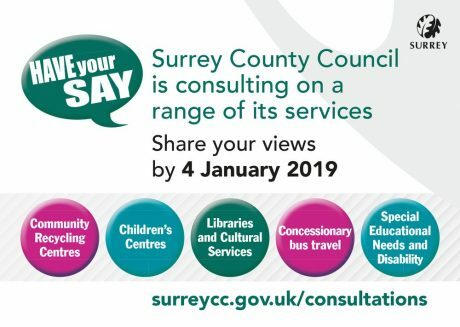 Surrey County Council has recently launched an online public consultation about Transforming Libraries and Cultural Services in Surrey. Surrey Arts is included in the consultation as one of the Council’s Cultural Services so this is a very important opportunity for you to share your ideas and comments about Surrey Arts as well as other cultural services. In Section 2.1 – You can share your ideas. Please name Surrey Arts if you are specifically referring to the service. In Section 3.8 – Please give the location where your activity takes place. In Section 4.3 – You can provide additional comments. Please make sure that you name Surrey Arts if you want to comment about the value of this particular service. The online form should not take long to complete, but your responses will be very valuable as the Council considers its future strategy for Libraries and Cultural Services. Please note that the online consultation will close on 4th January 2019.